Steam is a gas created by heating water in a boiler or heat exchanger. After being distributed via pipes, steam can be used to generate electricity via steam engines and steam turbines. Steam is also used in coal liquefaction in oil refineries. Since steam is a fluid, it can be stored in a storage tank. The amount of energy contained in steam is linearly proportional to it's temperature (minus 15°C ambient temperature). The energy storage of steam is exactly 200 Joule / unit / degree Celsius, so for every degree increase in temperature of a single unit of fluid requires exactly 200 Joules. In all cases, steam produced in boilers is 165°C and steam from heat exchangers is 500°C. This higher temperature equates to a higher energy density of the same number of units of steam, meaning: higher temperature, more energy per volume. Steam suffers no thermal losses sitting or flowing through pipes or storage tanks, the energy put into water to create steam is the same amount of energy you get back out from it since both steam engines and turbines are 100% efficient. A storage tank holding 25000 units of Steam at 500°C thus contains 2.425 gigajoules of energy, a surprisingly large amount equal to 485 fully charged accumulators! If the temperature of the steam is lower than the steam engine or turbine can handle, then the power output will be lower than optimal, but no energy will be wasted. However, if the temperature of the steam exceeds the maximum temperature of the steam engine or turbine, then the power output is capped at maximum, and the extra energy in the steam is wasted. Other than this difference, either steam engines or turbines can be used to generate power off of steam from any source. 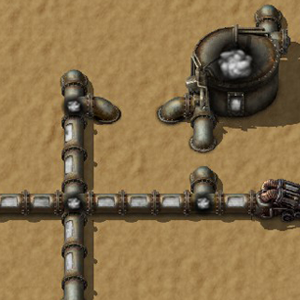 The fill meter on steam storage tanks fills from the top instead of from the bottom. Introduced as separate fluid. Previously it counted as Water, with a >100 temperature. This page was last edited on 5 March 2019, at 14:15.